This work of fiction was written by Greg Lewbart, veterinarian and assistant professor of aquatic medicine at North Carolina State University. It is his first novel and centers around the Big Cypress National Preserve, and Everglades City, of south-west Florida. The plot revolves around Malcolm Grimes, a red-neck ex-poacher, now working for the Florida Fish and Game Commission as a panther tracker in the Florida Panther Project. 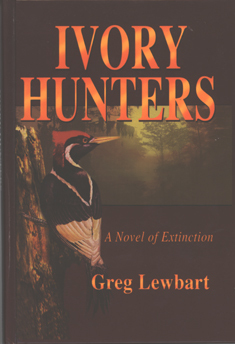 The story begins with an accurate description of an outing to capture and tag a panther after which Grimes has a sighting of a rare, and thought to be extinct, Ivory-billed Woodpecker. With his dreams of a get-rich quick scheme, he involves three other parties, all of whom have different motives or finding and capturing this rare bird, or birds. However, in his cunningness, Grimes is opposed by Hal Noble, an expert marksman and wildlife officer with the Florida Game and Freshwater Fish Commission. So, the story is one of greed vs. duty. The book is an easy read. It is an informative story of intrigue and double-cross, set in an accurately detailed description of life and conditions among the flora and fauna in the forests, swamps, and bogs of the Big Cypress Preserve right here in our own backyard. This book will be of interest to anyone who is concerned about conservation and preservation of wildlife in Florida. It is an eye-opener as to how far-reaching the exploitation of wildlife can be carried out.